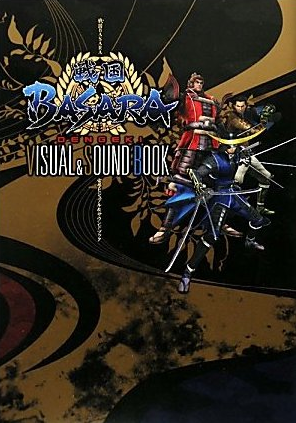 The Sengoku Basara Dengeki Visual & Sound Book is another anthology which comes with its own special audio CD. There's no continuity between this and the other four Visual & Sound Books. Just as with the other books, the Dengeki Visual & Sound Book opens with a 'Gravure of Heroes' illustration collection. The theme is pairs of heroes this time and it starts off with a collection of articles exploring the various friendships and rivalries in the series. Next comes a selection of full colour illustrations by the artists Aoi Levin, Kirishima Sou, Nagasawa Shin, Kazuaki, Hitaki, Shishizaru, Tsunako, Wolfina, Amajio Komeko and Kazama Raita. It's really weird seeing Tsunako drawing the Date forces for once instead of her favourite Takeda characters. Next comes the main part of this book, a manga to tie in with the included audio CD. This is where things get a little confusing. For the Dengeki Visual & Sound Book, the pages come straight from the second half of Haibara Yak's Sengoku Basara 2 manga (the same one I reviewed here the other day, released in English as Sengoku Basara: Samurai Legends). The entirety of Act 17: The Trickster and one scene from the climax of Act 18: Unbridgeable are reproduced in full, providing a coherent storyline about how the Toyotomi and Date forces were trying to outthink one another before a big confrontation. The CD drama track is titled Comic Sengoku Basara 2 -returning to Zero.- and rather than being designed to be read alongside it, the audio performance carries straight on from the manga extract in the book starting with Act 19: Vengeance. It goes on to finish the story of the Sengoku Basara 2 manga, mostly word for word from the speech balloons. Since the CD only features Nakai Kazuya (Date Masamune), Morikawa Toshiyuki (Katakura Kojuurou), Okiayu Ryoutarou (Toyotomi Hideyoshi), a narrator and some miscellaneous soldiers, scenes with the other main characters have been completely omitted. This is less confusing than it sounds since only one brief scene with Kojuurou had to be cut at all to accommodate the restriction. The Toyotomi/Date storyline stands alone quite well. I found making the audio drama a follow-up to the manga printed inside the book rather strange. Still, it was pleasant to hear the manga acted out with three of my favourite seiyuu and students of Japanese who happen to have books available might enjoy listening to this drama while referring to the English translated manga when necessary. The audio performance is a generous length too, clocking in at almost 25 minutes; it even includes 13 minutes of seiyuu chit-chat as a bonus. The seiyuu discussions on the CD tie into the book again, unexpectedly. This time the usual pages of fan contributions such as artwork, letters and gags are accompanied by comments from Nakai, Morikawa and Okiayu themselves. There are even pictures of the actors holding the fan art to thrill the lucky people whose illustrations were chosen. The final four pages of the book are devoted to preview images of the then-upcoming Sengoku Basara 3 game. I have mixed feelings about this volume overall. The audio performance was good and longer than usual, yet reusing the manga and removing the gimmick of being able to read along with it (without buying additional books) was a questionable decision by the producers. 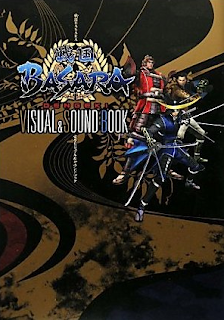 Sengoku Basara Dengeki Visual & Sound Book was published on 26th December 2009 by ASCII Media Works and it's still readily available from good Japanese bookstores such as Yesasia and Amazon at its original price of ¥1,800. Sengoku Basara Magazine cover art?